Summer is finally on it’s way, and I’m am so ready for sunny days with my boy/s. 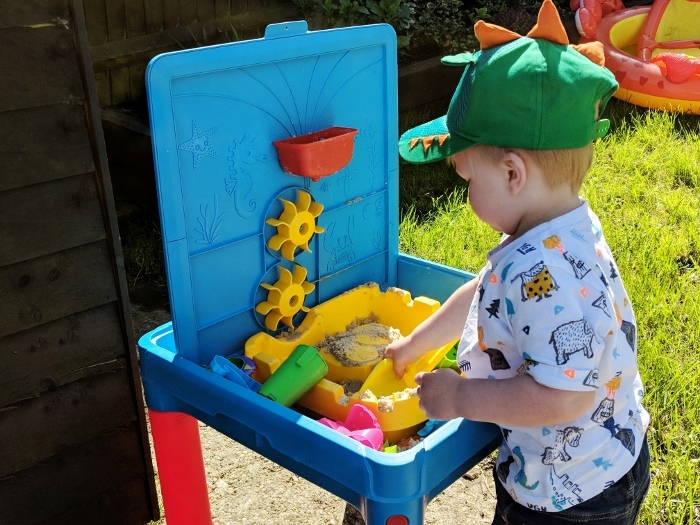 With my starting maternity leave at the beginning of the summer, and Henry dropping a day at nursery, I wanted/needed to create a list of things to do on a budget with my boys. 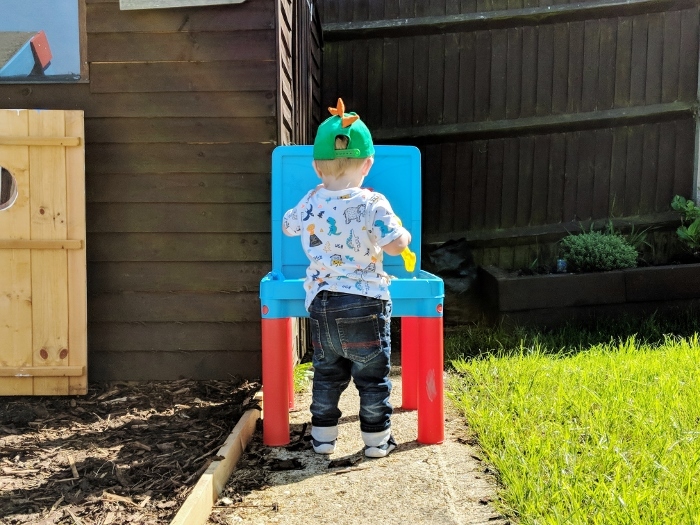 I’ve admitted before that I’m not always great at playing, but like to do things with them both obviously, plus summer means lots of outdoors time. I want to get out and about as much as possible as I think I parent at my best when I’m out rather than cooped up at home. 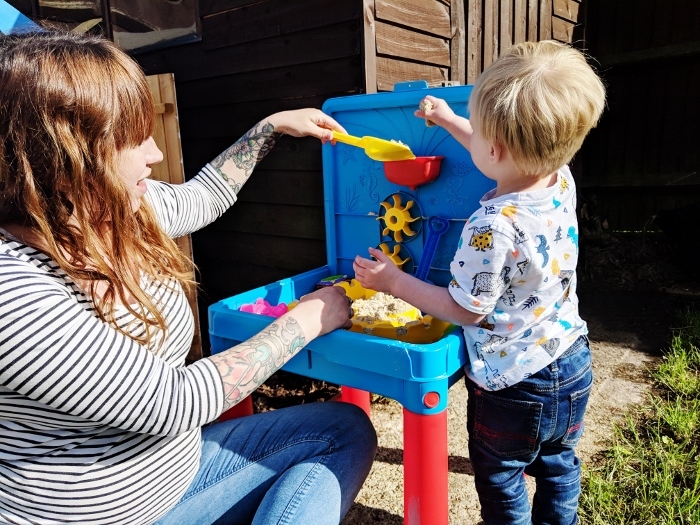 So I’ve started to compile a list of budget-friendly toddler, kid and family activities to get me inspired and motivated, for hopefully, the best summer ever! 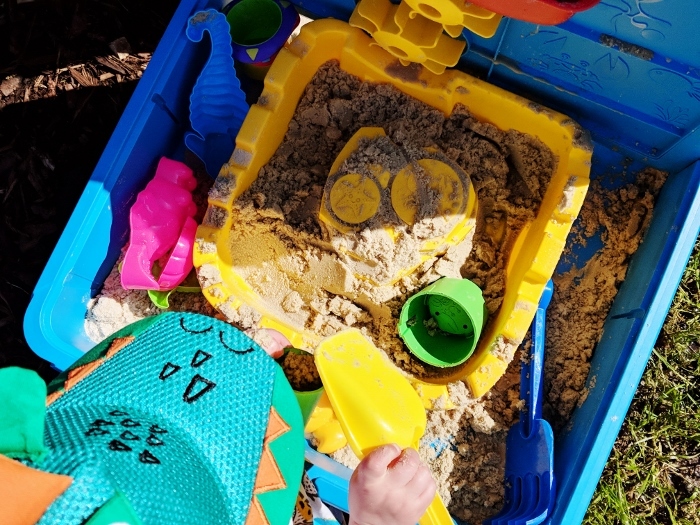 Get yourself a sand table and some play sand and you’ve got hours of fun, especially if you add some water. 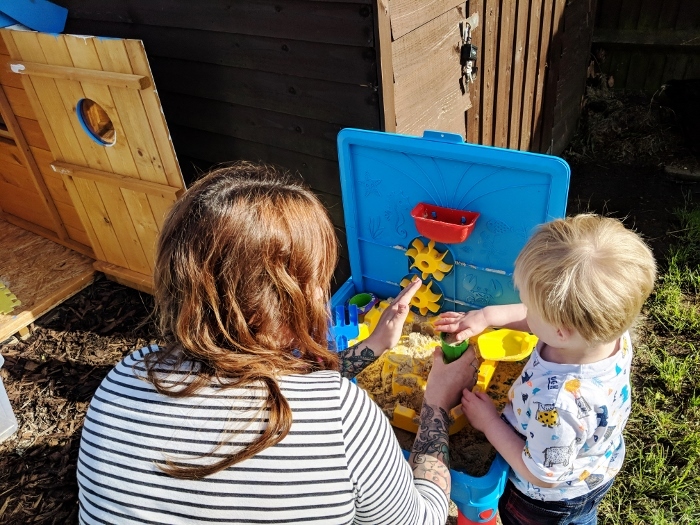 Our table was from Tesco last year and was a total bargain, but if you aren’t fancying a full table, a big plastic box and some sand with a few toys, and maybe a truck through in will sort a little one out for a good while. Plus you can do this indoors if you’re really stuck on a wet day! We live right by a woods so country walks are an easy escape. We can look for different animals, collect leaves and sticks, and find some streams to splash about it. All for nothing. Henry loves slides, so play parks are a must. And I know my local area has a couple of splash pads too which I really want to find, on a mid-week day! Plus take a football for extra fun and to get those wiggles out! One of my favourite things we tried last summer, strawberry and fruit picking. It makes for a fun and educational afternoon, plus you can stock up on good foods for the home, which are usually cheaper than going to the supermarket. I have a water child, and I loved water fights as a kid, so this is a must for the really hot summer days – yes, I’m wishing for lots of hot days. If you’re green-fingered like me, then why not try your hand at some simple herbs, veggies and plants grown at home. Sunflowers are perfect for the garden and your littles will love watching them grow nice and tall. And this herb garden is perfect for beginnings, and goes well with all those summer salads. A new one for us this summer, our local country park leads right to the estuary, and is a well known spot for crabbing. I know Dann is particularly looking forward to doing this! All those fruits and veggies you picked are perfect for homemade smoothies. We love making smoothies, and getting Henry involved, plus it’s the perfect excuse for a few minutes indoors. Also they tend to freeze well, so you can make yummy, healthy lollies too. For cooler days, grabbing a bit of culture and maybe a coffee date feels like a good idea. I know Southampton is growing a rather good collection of galleries and museums, so I’m definitely going to try a few of them out this summer. Many are free, or low cost, and some run special sessions specifically for toddlers and kids too. One of my favourite things to do with Dann was pretend to be a tourist in our local area and go exploring. Our nearest city Southampton has so much to offer, as does Portsmouth and Winchester, plus we have Bournemouth and the New Forest close by too! But anywhere works, just start looking for all the old history and fall in love with your home. For rainy indoor days we tend to get crafty. A recent favourite of mine is a sensory bowl. Fill a large bowl or box with rice/pasta/cereal etc, add some spoons and cups and maybe some plastic toys, and let the little ones go. This can be a bit messy but nothing a dustpan and brush can’t handle. Also it’s great for helping with hand/eye coordination and learning textures, so fun and learning! Another of my favourite things to do. We have an annual pass for our local farm, but will be using this summer to find a few more. Local Council run ones are usually a little cheaper, and tend to be really clean and designed specifically for families. Not just a fun day out, but super educational too. Henry knows so many animals because we visit so often. One for a special summer day, head in to London and check out the top things to see in London. Some of the best museums and parks can be found in our Capital, and who doesn’t want to search out a few Instagram locations whilst you’re there too? Sandy or stoney, both can be great fun with fish and chips, an ice cream and a little paddle. Personally we’ll be doing Poole and Bournemouth this summer as a minimum. 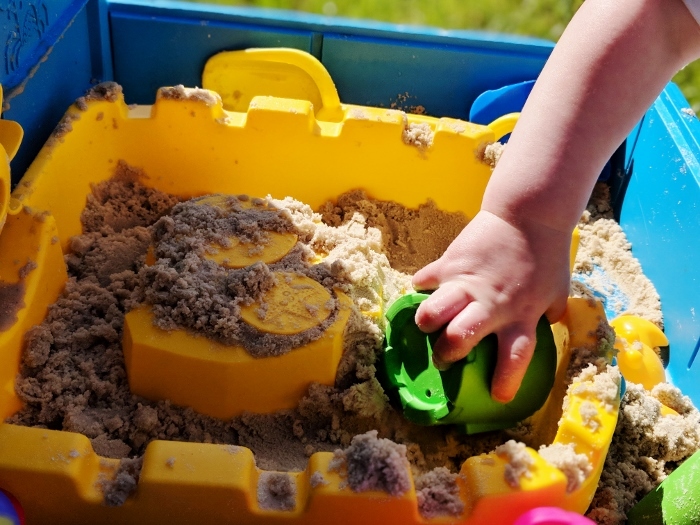 Take a bucket and spade for sand castles, or shell and pebble collecting. This is just the start of my little list for the summer. Perhaps ambitious, especially with a newborn in tow, but you only live once, and I think Henry deserves all the fun I can create for him. *collaborative post – includes a paid-for link – all opinions and ideas are my own. "22 little things you can do as a family to be more eco-friendly"